How would you like to change the décor of your bathroom quickly and easily, with no painting, wallpapering, or flooring switches required? How about a quick-change tattoo for your toilet? This is not your grandmother’s fluffy toilet seat cover. Literally, it is an easy-on, easy-off toilet lid embellishment that wipes clean and can be used over and over. With this new patent-pending concept, can change the appearance of your toilet just as easily as you can hang a new wreath on your front door. Toilet Tattoos are made from electrostatic vinyl film. To change the look of your toilet lid, just peel a toilet tattoo from the cardboard backing that it is stored on and place it on the toilet lid. It clings firmly, but does not stick like an appliqué or other adhesive item would. When you’re read to remove it, just pick it up. There will be no residue or mess. You can put it away and use it again when you’re ready to alter the appearance of your bathroom once again. You can purchase Toilet Tattoos in many different designs, so it’s easy to change the look for your bathroom seasonally or for special occasions. 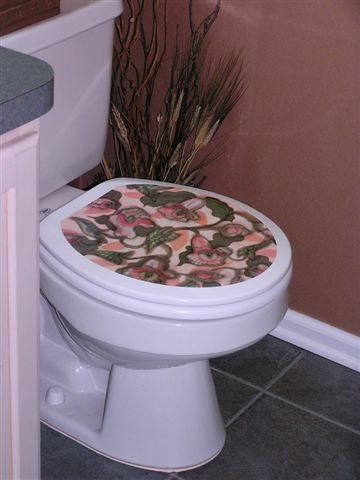 You can even special-order customized Toilet Tattoos with your own photographs, paintings, or other images. The company’s logo is terrific: Toilet Tattoos: The Only Way to Crown Your Throne. Fashion design entrepreneur Celeste Massullo is credited with coming up with the toilet tattoo concept. She explains, "I wanted to decorate my toilet in a creative, modern and clean way, but soon realized that toilet décor products had not changed for decades. So I created Toilet Tattoos to give consumers a contemporary and simple choice to decorate their commode." You can own your own Toilet Tattoo for just $9.95. For more information, see www.toilet-tattoos.com.